This one is a riot. 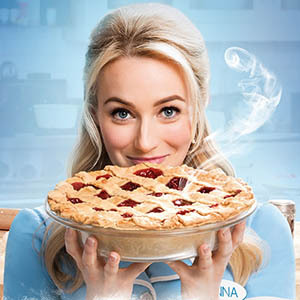 Sara Bareilles wrote the score for this one, about Jenna who was a waitress at Joe’s Pie Diner. Jessie Nelson did the script and everything works well. The story is based on Jenna (Christine Dwyer) who is a pie baker at Joe’s and in an abusive marriage. He husband, Earl (Matt DeAngelis) is a good old boy character and pretty much egocentric. Jenna’s boss, Cal (Ryan Dunkin) is the sort of tough guy manager at Joe’s and he has some problems from time to time with Jenna and the other two waitresses, Dawn (Jessie Shelton) and Becky (Maiesha McQueen). After all, working in a small town diner isn’t the dream job for most folks. The owner, Joe (Richard Kline) shows up most days for his breakfast with special orders. Things get more involved when Jenna becomes pregnant and meets up with that new doctor, (Steven Good) with whom she bonds instantly, even though the doc’s nurse (Rheaume Crenshaw) susses out what’s going on. And a new guy shows up at the diner, Ogie (Jeremy Morse) who is a laugh machine as well as a fancy dancer. There is also a live band of six players who are mostly on stage from scene to scene, albeit in the background. But, quite interesting in the cabaret style of performance. The cast moves easily though 18 numbers, and the audience goes wild. Especially when Act II, Scene 1 hits the boards.